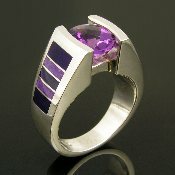 We offer many sugilite ring designs in sterling silver for women. The sugilite we use in our rings ranges from a light purple or lavender to a very dark purple. Sugilite is a natural stone so there may be some veining or variation in color in the stone. 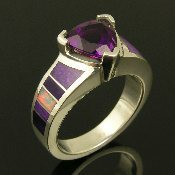 Keep in mind that any of the ring designs you see on the site may be inlaid with sugilite. A substitution or upgrade fee may be charged for changes. 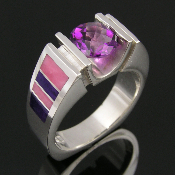 Your sugilite ring will be made to order in your specific ring size in 3 to 6 weeks. Matching sugilite earrings, pendants and bracelets are also available to accessorize your new sugilite ring! 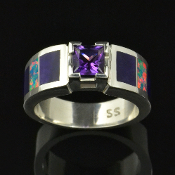 Sterling silver black diamond wedding ring inlaid with sugilite and black onyx. 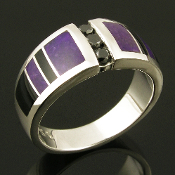 Handmade ring features 3 channel set round black diamonds flanked by alternating black onyx and purple sugilite inlay. 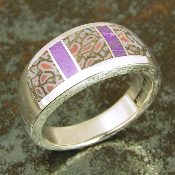 Handmade sterling silver woman's amethyst ring inlaid with Australian opal and purple sugilite. The purple sugilite inlay looks great with the .66 carat purple trillion cut amethyst. Sterling silver ring inlaid with Australian opal and sugilite Sterling silver ring inlaid with dinosaur bone and sugilite Sterling silver ring inlaid with Australian opal and sugilite. 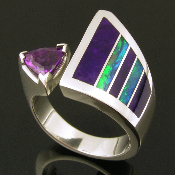 Handcrafted sterling silver ladies ring inlaid with Australian opal and top quality sugilite. Top and bottom pieces of Australian opal inlay fire an irridescent red, orange and yellow. 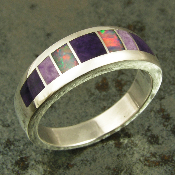 Australian opal and sugilite inlay handmade sterling silver ring. Ring is inlaid with 3 pieces of dark purple sugilite and 2 pieces of lavender sugilite. 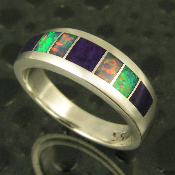 The Australian opal inlay fires multiple colors. 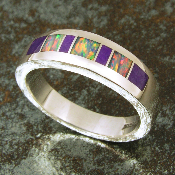 Stunning sterling silver woman's band inlaid with sugilite and Australian opal. 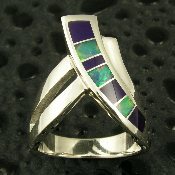 High quality Australian opal like the opal inlay in this ring is becoming harder and harder to obtain at any price. Sugilite is named for the Japanese geologist who discovered the first specimens in 1944, Mr. Ken-ichi Sugi. The location of the first discovery was the Iwagi Islet in Southwestern Japan. The original Japanese sugilite samples were just tiny, yellow crystals with no gem value. In 1955 some dark pink crystals of no gem value were found in India that were also identified as Sugilite. In 1975, the only known deposit of gem grade sugilite was found in the Wessel Mine in the Kalahari Desert near Hotazel in Kuruman, Republic of South Africa. At first it was thought to be a very small sugilite deposit, but later found to be a commercial sized deposit estimated to contain as much as ten to twenty tons located 3,200 feet below the surface. Sugilite commands a high price for an opaque gem material, due in part to the difficulty of removing it from such a great depth. Sugilite often contains black matrix, reddish brown or yellowish blotches. Some of the lesser grades have very light purple to white areas. Opaque bright purple stones with little matrix or blotches are the highly valued. While almost all sugilite is opaque, a very small percentage, perhaps 1/10 of 1% is translucent. Due to its rarity and mesmerizing beauty, this gem grade commands the highest prices. At its peak, stones of this quality climbed to as high as $1000 per carat. Sugilite ranges between 6.0 - 7.5 on the Moh's scale of hardness. Sugilite is also known under the trade names of "Royal Lavulite" and "Royal Azel".